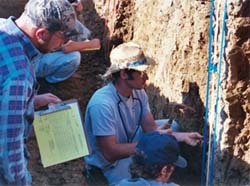 The Department of Agriculture, Geosciences, and Natural Resources offers an Bachelor of Science degree program in Geoscience. Geography -- the study and mapping of the locations, characteristics, spatial distributions, transformations, and interactions of the earth's environmental and human phenomena. Geology -- the study of the materials and processes which have shaped the earth's physical surface and interior. Meteorology - This program is the only one of its kind in the state of TN. It is designed to train students for a career in the atmospheric sciences and to supplement their training in geosciences. 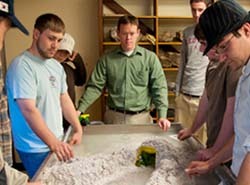 Minor degrees in geography and geology are also available to all students on campus. We invite you to learn more about what we have to offer. Please utilize the links in the column to the left to see more information about the Geoscience degree program at UT Martin. If you have any questions or would like to visit the department, please communicate with us at your earliest convenience. Median salaries for geoscience-related occupations.